Some days are just not warm enough to grill and too nice to turn on the oven. 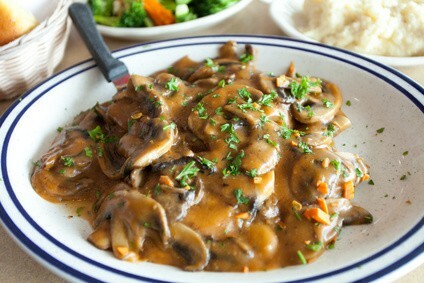 That’s a day our home choices to make Creamy Chicken Marsala. This is one of my favorite ways to fix chicken which can often be dry and tasteless. We’ve lightened it up a bit from the tradition Marsala recipe. “Marsala” is a type of wine often thought to be strong, dark wine drank with sweet dishes. It is used in sauces or desserts. This recipe is perfect for four. 4 organic skinless, boneless chicken breasts. Thinly slice the breasts in half or you can pound them with a meat tenderizer. 3 TBP of olive oil. If you have an Evo store near We enjoy the Garlic or Italian infused oil. Warm ½ the oil in a large skillet carefully. Place the chicken breasts gently into the skillet lightly sprinkling with salt and pepper. Cook until lightly brown on both sides turning as needed to cook throughout. Remove the Chicken to your serving platter or tray. In the same skillet gently warm the rest of the olive oil. Add onion, mushrooms, and garlic for 2-3 minutes until the onions and mushroom are slightly translucent. Add the Marsala wine bringing to a light boil. This will remove the alcohol and leave the flavor. Add in chicken broth, half and half milk, and mustard spice. Bring to a slow simmer and allow the sauce to thicken. This takes about 8-10 minutes. Remove meat to a serving dish, pour the sauce over and sprinkle with parsley. Serve! There are many ways to prepare a Creamy Chicken Marsala. Because the original calls for heavy cream, this is a lighter version. A variation of this dish is named Creamy Chicken Tarragon. Just use a white wine and add to the recipe ½ to 1 TBP of crushed Tarragon. If you want to make Chicken Tarragon a much lighter version remove the half and half and increase the broth a ¼ cup. The sauce will be thin and can be thickened. Add ¼ tsp of arrowroot mixed with the cold wine or broth. We’d love to hear your alternatives and ideas on this famous recipe. Don’t be shy please share your Creamy Chicken Marsala recipe below. images copyright 2016 Fotolia all rights reserved.